CARSON, Calif. – Fifteen of the 16 players who competed in qualifying Monday for a chance to advance and have a shot at the four all-important main draw singles spots into the Carson USTA Women’s $50,000 Challenger presented by the Farmers Classic had U.S. behind their names on the draw sheet. And you would even call the 16th a full-fledged American as Jessica Roland-Rosario was born in nearby Hollywood, Calif., but is currently representing the unincorporated U.S. territory of Puerto Rico. Roland-Rosario, a 29-year-old former two-time All-Big 12 selection at Texas A&M, beat No. 5 seeded 14-year-old American Anne-Liz Jeukeng, 6-2, 7-5, at the Home Depot Center in Carson. 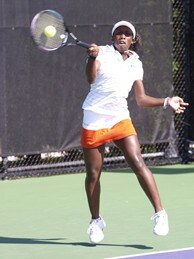 Several other young players moved on Monday as well, including newly turned 16-year-old Sachia Vickery, the No. 7 seeded player from Miramar, Fla., who rolled past Desiree Tran, 6-2 6-0. She will face Stanford-bound Ellen Tsay in the final round of qualifying Tuesday beginning at 10 a.m.
Fifteen-year-old Taylor Townsend beat fellow USTA junior player Mia King, 7-5 6-2, while USC-bound Zoe Scandalis also moved on with a straight-set win. Following the final four qualifying matches at 10 a.m., 14-year-old Gabrielle Andrews of nearby Pomona, will take on former USC All-American Amanda Fink on the main court, No. 4. Andrews received a wild card into the tournament by the USTA and is also playing doubles on Tuesday with Townsend. Followed by WS Amanda FINK U.S. Gabrielle ANDREWS U.S. Followed by WS Chichi SCHOLL U.S.  Asia MUHAMMAD U.S. Followed by WS Amanda MCDOWELL U.S. Grace MIN U.S. Followed by WS Marie-Eve PELLETIER (CAN) Jessica PEGULA U.S. Followed by WS Julia BOSERUP U.S.  Yasmin SCHNACK U.S. Followed by WS Jennifer ELIE U.S. Brittany AUGUSTINE U.S. Followed by WD Yawna ALLEN U.S. / Svetlana KRIVENCHEVA (BUL) Samantha CRAWFORD U.S. / Caroline DOYLE U.S. Followed by WD Alexa GLATCH U.S. / Marie-Eve PELLETIER (CAN)  Roxanne ELLISON U.S. / Sierra A. ELLISON U.S. Followed by WD Alexandra MUELLER U.S. / Asia MUHAMMAD U.S.  Grace MIN U.S. / Ashley WEINHOLD U.S. Followed by WD Megan FALCON U.S. / Amanda MCDOWELL U.S. Gabrielle ANDREWS U.S. / Taylor TOWNSEND U.S.